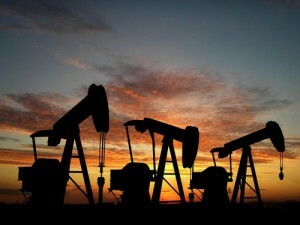 Oil prices hovered below $107 a barrel Monday in Asia as simmering tensions over Iran’s nuclear program kept crude near 10-month highs. Benchmark oil for April delivery was up 7 cents to $106.77 at late afternoon Singapore time in electronic trading on the New York Mercantile Exchange. Brent crude was down 10 cents to $123.55 per barrel in London. “The magnitude of the response to the unfounded rumor highlights a tight crude supply situation that will be keeping the entire market highly responsive to even the smallest hint of a supply disruption,” energy consultant Ritterbusch and Associates said in a report. Crude has risen from $96 last month amid investor fears that growing tension over Iran’s nuclear program will spark an armed conflict and disrupt global crude supplies. Analysts say Saudi Arabia and other oil producers do not have enough spare capacity to quickly make up for Iran’s 4 million barrels a day of crude. In other energy trading, heating oil fell 0.1 cent to $3.20 per gallon and gasoline futures were down 0.6 cent at $3.27 per gallon. Natural gas fell 5.6 cents at $2.43 per 1,000 cubic feet.